Just a few days ago, the rumored Intel Core i7-8086K Anniversary Edition processor’s specs were laid bare by retail leaks, and now we know when the chip will debut. Ironically, in a post defaming retail leaks about the supposed special edition chip, Overclocker’s Gibbo let loose that the Intel Core i7-8086K Anniversary Edition will be announced and up for preorder on June 8th. What’s more, Gibbo details that the chip will retail for under £400 (about $530, AU$705), which is a far lower price than the one that leaked earlier this week. According to the latest rumors, the Core i7-8086K will be the Intel’s fastest 6-core consumer processor yet. 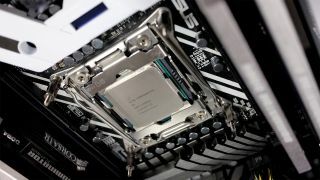 Although, it features similar specs to the company’s current flagship Core i7-8700K including 6 cores, 12 threads and 12 MB of L3 cache, the new chip is said to be 300MHz faster overall. This increase in frequency would put its base clock speed at 4GHz with a 5GHz boost clock – and that’s just the speed of this supposed chip straight out of the box without factoring in overclocking potential. It’s almost a given that we’ll see the Intel Core i7-8086K Anniversary Edition processor announced at Computex 2018, but we’ll hold our enthusiasm for it until it’s actually real. What about an Intel Cannon Lake announcement?